Like most sewers, I’m always seeking inspiration. Pinterest can consume endless time, but it is so much better than any physical file system, the pictures can’t get lost. I love all the decorated dress forms on Pinterest and managed to quickly put one together for Christmas. 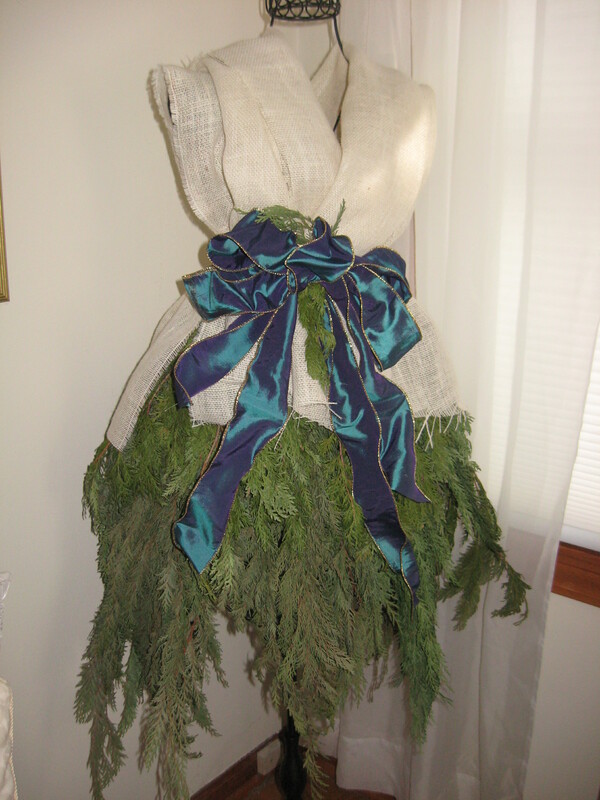 Since it was a wire dress form, it was easy to attach the cedar branches to the form with florist wire. The ones I saw on Pinterest had natural burlap for the bodice for a more rustic look. Christmas 2012 I wanted to make some fun fur infinity scarves as gifts. I experimented with a couple of the fake furs available, but it seemed too stiff. While running into TJ Maxx for gloves, I noticed some very soft fake fur throws. 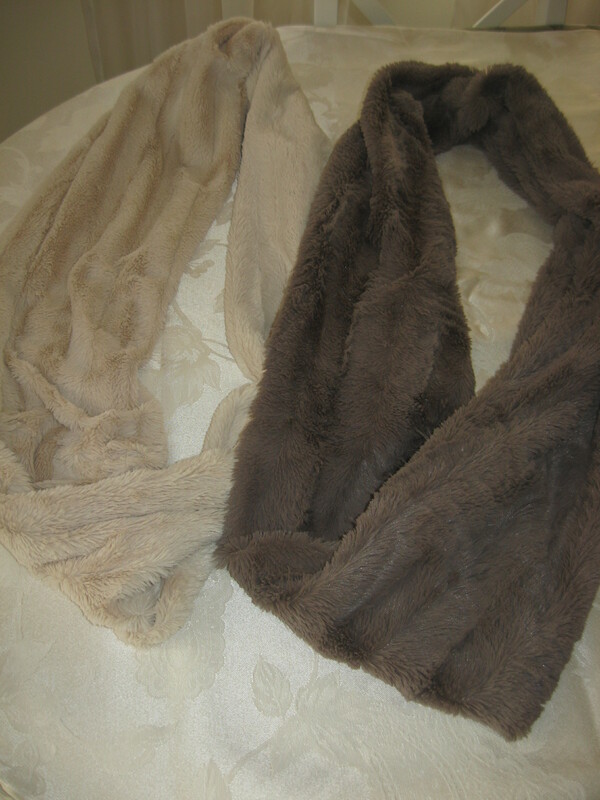 They were the perfect weight and softness for the scarves and more cost effective too. I could make 3 to 4 scarves out of each throw and they wash beautifully. I ended up making 20! Some gifts I made for Christmas 2013 were from leather I found in the summer at the Scrapbox in Ann Arbor, MI. The Scrapbox sells donated, recycled materials. It’s a favorite resource for many local teachers and scout leaders. I stopped by to pick up materials for a project at work and stumbled upon their big annual sale. Leather was not on my list for the work project, but I couldn’t pass up adding some leather to my sewing stash, right? I suspect it was donated by one of the automotive seat manufacturers. I was short on time this year, so I had to keep it simple, thus zippered pouches. 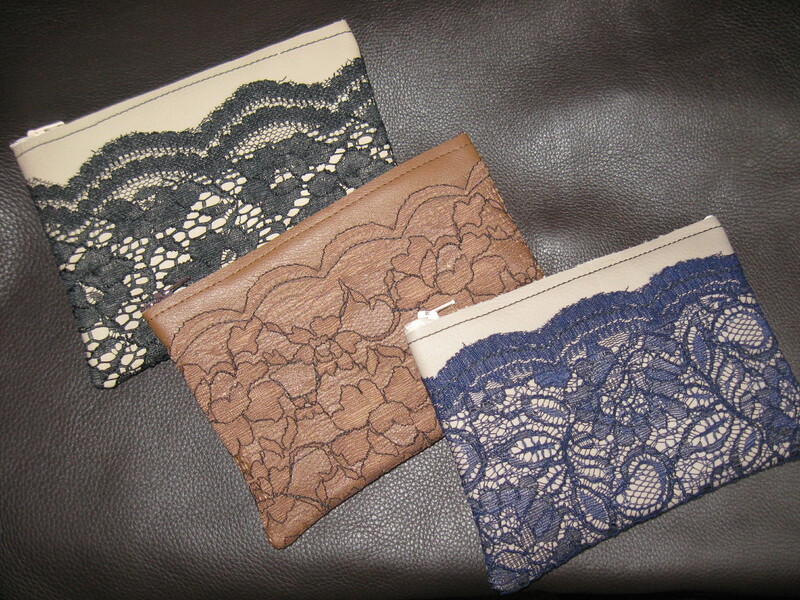 The blue lace was a scrap I had from a lace top I made, the others were purchased in small amounts for this project. The brown turned out to be a perfect match and created an embossed look. It’s fun to give unique gifts, but the pressure is on. What am I going to do for next Christmas?